There are two sections in “Debating the Digital Divide.” The first talks about the dynamics of funding for digital literacy programs in the United States. I concentrated on the first section in my original system description. The first section talks about two balancing loops, but does not talk about the reinforcing loop that's related to them. The second section talks about some digital literacy programs in countries other than the United States. The second section demonstrates a corporate initiative of HP to increase digital literacy, but does not talk about the way this does or does not relate to the way globalization disables economic growth in areas outside the core of the world-system. 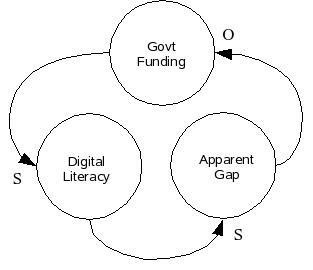 In the first section, the primary causal loop is a balance between digital literacy and government funding. 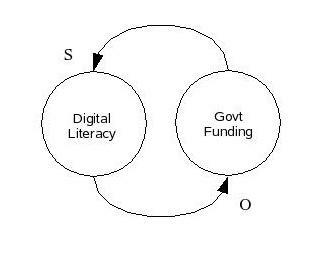 As I modeled in my previous system description, increased funding does increase digital literacy. 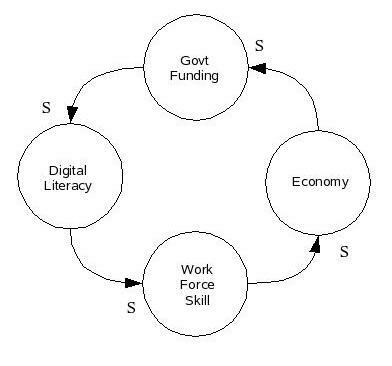 However, the more digital literacy increases the less pressure there is to increase government spending. Another way this happens is an economic principle of marginal cost, where each marginal increase in digital literacy is more expensive than the last. For example, when a person is thirsty, they highly value a glass of water. However, each glass of water after the first is less valuable. Eventually, in fact, the water can become counter-productive in excess. When talking about issues like digital literacy or pollution clean-up, the marginal benefit of each increase is less than the previous and the marginal cost increases. Generally the last marginal increase in digital literacy will cost as much as all previous increases combined. As the marginal benefit decreases and the marginal cost increases, the incentive to spend on the initiative is less and less. There is an additional balancing loop from the Bush administration's misuse of statistics. Any increase in digital literacy among the most important demographic appears as massive growth when compared only at the level of percentage increases. A small number becomes a huge percentage increase when previous numbers are so depressed in that demographic. This apparent gap favours demographics that already have high numbers of digitally literate members. Any increase in actual digital literacy is now further depressed by this loop. The Bush administration 's statistical analysis acts as a further sap on government spending mentioned more fully in my first system description assignment. There is a way out of the catch-22 I pointed to here. The loss of government funding is disabling a reinforcing loop of economic growth. When digital literacy increases, the capable work force increases. This in turn increases the economy and that should be recognized as reason enough to further increase government funding for digital literacy programs. 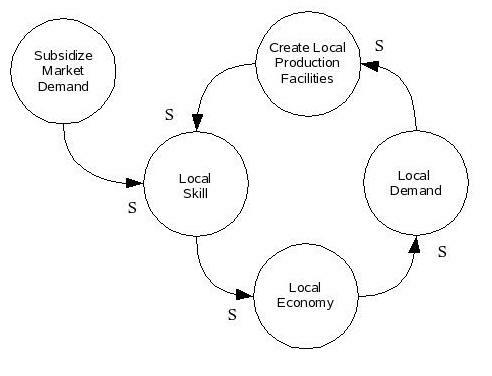 This could become an ever increasing economic model if the balancing loops can be made secondary. If HP did not intend to create a local market before creating local production facilities, the efforts will likely go down the same road as other globalization initiatives. The local population will merely become a cheap labor source which will become more skilled and eventually demand more pay. When this happens maintaining the local production cannot be justified and the race to the bottom moves those production facilities to another country. By subsidizing a local market demand, HP is creating local skills with those digital tools and this encourages the local economy. Increased economic activity, will likely generate additional demand for both subsidized and also unsubsidized digital tools. This demand justifies the creation of local production facilities. Work in these facilities increases local skill, and that's a reinforcing loop. By subsidizing local digital skills, HP is able to reinforce and entire system of local economic development. Jacobs, J. (2000). The Nature of Economies. New York, NY: Vintage. McCormick, T. J.. (1995). America's Half-Century: United States Foreign Policy in the Cold War and After. Baltimore, MD: Johns Hopkins.